There is a deep peace that can be found in the quiet of the night...resting from the demands of work, family, friends...pondering the activities of the day. It is a great time to share those cherished moments with the One who loves you most. Good Night, God! 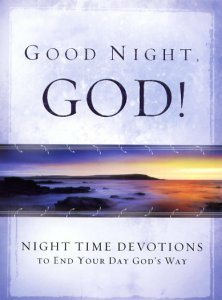 is a nighttime devotional that offers you a collection of inspiring scriptures, true-to-life stories, and encouraging reflections to help you draw near to the heart of God and experience His life-changing grace. As you turn your focus from the day's events you will discover calm rest in God's precious promises and enjoy refreshment in His unfailing presence. End Your Day God's Way ~ With Quiet Confidence, Expectancy, and a Sure Trust in the One Who Watches Over You.